Sunset Fields Golf Course and the Crenshaw Fairways are long gone. Today, the address is an Albertsons. Via Google Street View. 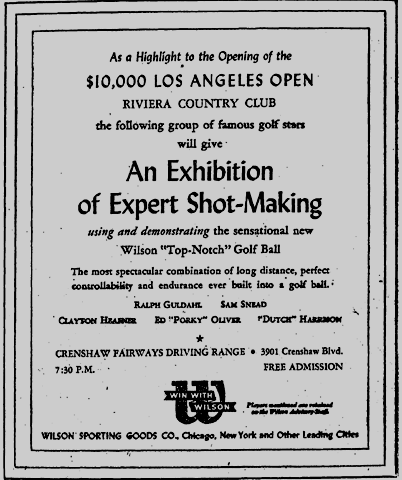 An exhibition of expert shot-making, Jan. 2, 1941, featuring Ralph Guldahl, Sam Snead, Clayton Heafner, Ed “Porky” Oliver and “Dutch” Harrison. This entry was posted in Found on EBay, Sports and tagged #EBay, Crenshaw district, golf, sports. Bookmark the permalink.